See how easy cruising can be as you explore Europe. Princess MedallionClass streamlines your vacation with everything from expedited boarding to drinks on demand, so you have more time to do what you love. A variety of captivating cultures are within reach in Europe. Our Local Connections program brings you the best each region has to offer. We’ve partnered with a trusted team of local experts, the continent’s leading cruise and tourism associations, to deliver more meaningful destination experiences. Before you visit, get an insider’s guide to essential experience and cultural treasures. Intriguing onboard speakers share personal knowledge of the region’s history and culture. Shore excursions are designed by locals to fit a variety of interests. Princess Cruises is proud to offer shore excursions for the whole family that not only will take you to the greatest bucket list attractions, like legendary ruins and storybook castles, but also introduce you to the local culture and flavors of Europe. Our Discovery at Sea™ Shore Excursions come recommended by two of the most trusted names in exploration – Discovery™ and Animal Planet™. Plus, on itineraries with More Ashore Late Night calls, we stay until at least 9 p.m. in port so you can also experience some of the fabulous nightlife. See even more with a Europe Land & Sea cruisetour that combines an incredible Europe cruise with a multiple-night land tour exploring some of the most fascinating places in the world, sampling the culture, seeing the sights and of course, savoring local cuisine! Read about storied attractions, charming history, diverse cultures and preparation advice for cruising Europe. 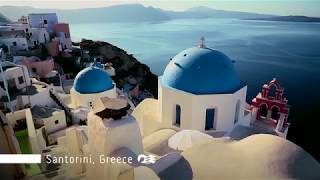 Learn all about our exciting options to visit Europe in 2020 from cruises to in-depth cruisetour vacations. Discover Italy's Amalfi Coast with Princess. There's so much to see during an Amalfi Coast cruise excursion, including gravity-defying, cliffside homes. Enjoy delicious cruise food during your travels. Passengers on a European cruise have the chance to visit the cruise ship bar or visit local eateries and pubs. Find some of the best Spanish sangria at these five restaurants of Barcelona. Enjoy authentic sangria in Spain as you tour Europe on your cruise. Choose from numerous shore excursions, including the Swiss Alps. Enjoy sky high adventures in the Swiss Alps while touring Europe on Mediterranean cruises. Explore the floating city of Venice, Italy. Venice architecture features buildings and palaces that almost defy gravity as they flow with the moving waters.